Mt Kilimanjaro: Mount Kilimanjaro It is the highest mountain in Africa and the highest free-standing mountain in the world at 5,895 metres (19,340 ft) above sea level. From Marangu Route: The Marangu route offers a well-developed and gradual trail to the summit of Mount Kilimanjaro. It is considered to be the more comfortable and easiest route, as your climb is moderate and constant with only the final leg to the summit slightly more challenging. Overnights will be spent in simple mountain huts. Breakfast at the camp, then ascend through the alpine meadow, and grassland and moorland to Horombo Hut (12,000ft). Both Mawenzi and Kibo peaks can be viewed easily on the way. Dinner and overnight at Horombo Hut. (Breakfast + Lunch + Dinner). Breakfast at the camp then further ascending to Kibo hut (15,000ft) The landscape becomes very stony and eroded. Spectacular mountain vegetation like giant cactus, groundswell and lobelia appear on the way. Dinner and overnight at Kibo Hut. (Breakfast + Lunch + Dinner). 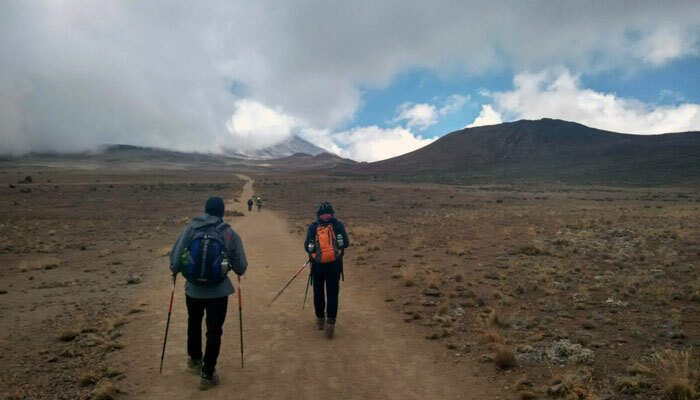 Wake up at midnight, and after a snack, proceed to the summit through Gilman's point, It is about 5-6 hours and 1-2 hours from Kibo Hut to Gilman's point (5685m) and from Gilman's point to Uhuru Peak respectively. Thus reaching the peak in the early morning of the fifth day and start descending after picture taking on the top to Horombo Hut. Dinner and overnight at the Horombo Hut. (Breakfast + Lunch + Dinner). Breakfast at the camp, Descend from Horombo Hut to Marangu gate. The waiting car will take you back to your hotel in Arusha. Dinner and overnight at the hotel. (Breakfast + Lunch + Dinner). Morning after breaklfast leave for Ngorongoro - The jewel in Ngorongoro's crown is a deep, volcanic crater, the largest un flooded and unbroken caldera in the world. About 20kms across, 600 meters deep and 300 sq kms in area, the Ngorongoro Crater is a breathtaking natural wonde, known for Approximately 25,000 large animals, mostly live in the crater include the black rhinoceros, the African buffalo, the hippopotamus, the blue wildebeest , Grant's zebra,Thomson's gazelles, Tanzanian cheetah, East African wild dog, African leopard & many more. (Breakfast + Pack Lunch at crater + Dinner). Breakfast at the hotel, later you will be transfer to the airport for your return flight. Journey Ends here. (Breakfast).